World Cup winner James Faulkner said he was “deeply embarrassed and sorry'' after being fined US$15,650 yesterday and banned from driving for two years. The 25-year-old all-rounder, who was named man of the match in this year's World Cup final, was nearly three times over the limit when his car was involved in a minor collision in July with the back of another vehicle in Manchester, northwest England. Faulkner, who plays with English county Lancashire in the city, had been at a restaurant and did not want to walk a mile home in heavy rain, Manchester Magistrates' Court heard. 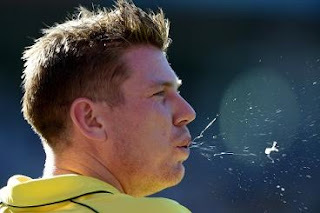 Cricket Australia last month temporarily banned Faulkner for “conduct that is unbecoming of a representative,’’ meaning he will miss Australia's limited overs matches against England and Ireland in August and September. He will have to undergo an alcohol management counseling program. Outside court, a statement was read to reporters on Faulkner's behalf. “My decision to drive that day was wholly my own and clearly it was an error in my judgment,'' the cricketer said. “I apologize unreservedly for my behavior but I accept this does not and should not excuse my actions.